Tis the season for food. Lots and lots of food. Last weekend we hosted our 16th annual Christmas party for that guy that I like so much's students...the annual party where we take one 1200 sq ft house and fill it with 50 college students. One more time. 1200 sq ft. 50 college students. It's loud and crazy and loud and fun and did I mention loud? The crazy part? I cook all the food...my feeling is that they eat in the cafeteria (which is excellent, by the way) all school year and it's nice to spoil them with some home cooking. Plus, I like to cook. Lots. The very first year we hosted this party I learned a very, very big lesson in what to do and what not to do. BIG LESSON. That first year I cooked for days...complete with a turkey and a ham and a road beef and ALL the sides that go with all those things. I was stressed and miserable and when the party time arrived, that group of students (who didn't particularly like my husband...he was the new guy after all) came, ate and left in record time. It was a complete FAIL in the party department. Enter Year 2. I scrapped the whole cooking for days thing and chose to do what I do best. Italian. Yep, it means lots and lots of meatballs but it also means everything can be cooked ahead of time in disposable pans and I can be an unstressed participant at the party. Every year I do the EXACT same party food wise. Baked rigatoni, meatballs, italian sausage, caesar salad, garlic bread, hot chocolate and cookies. My boys (the ones who live here) are a HUGE help to me and in recent years? Friends who volunteer to serve the food and others who have offered to bring desserts. Life savers. Now, instead of coming and eating and dashing out the door, we often have to push them out because we are old now. And tired. Every year, I think back to that first party. We were SO young (16 years ago!) with only two little boys...one of those little boys is now a senior in college and is one of the students at the party. Time just keeps marching along, doesn't it? Mix everything together in a big bowl. 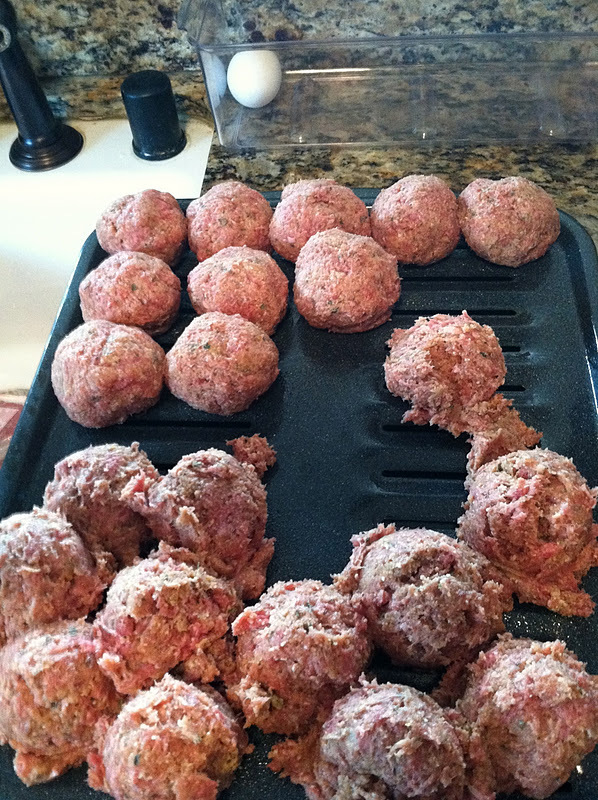 Scoop (I use an ice cream scoop) out onto a lightly oiled baking sheet (I use broiler pans) and then roll into balls. Bake at 350 for 30 minutes and then drop into a pot of gravy (normal peeps call it sauce, I guess) to finish cooking. Makes 20-25, depending on how big you make them. For our parties, I double this recipe FOUR TIMES for a total of approx. 200 meatballs. I can't tell you how excited I am to have this recipe! Guess what I'm making on the 1st day of my break? !